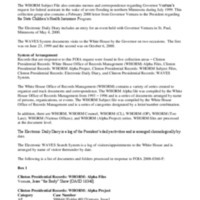 This collection consists of material regarding correspondence and meetings between President Clinton and Minnesota Governor Jesse Ventura. The collection includes records concerning visits of Gov. Ventura to the White House, an event held with Gov. Ventura in Minnesota, and Gov. Ventura’s request for federal assistance in the wake of severe flooding in northern Minnesota.